Late last month, Samsung created a major flutter in the affordable smartphones segment when the company announced its new M-Series devices in India. The two M-Series handsets went on sale earlier this week and were well received by consumers and reviewers alike. 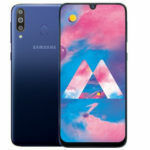 Before Samsung made the Galaxy M10 and the Galaxy M20 public, there were also talks about a third device from the company – the Galaxy M30. 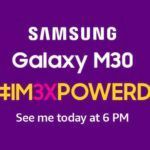 Samsung has, to this day, remained mum over the existence of the Galaxy M30 neither acknowledging or denying the existence of this device. Recently though, images of the schematic layout of the handset appeared in the wild thanks to iGyaan. We also sort of know the complete specifications of the handset. A quick glance at the leaked schematic layout of the Galaxy M30 is enough to convince you that this device is visually near-identical to its siblings. 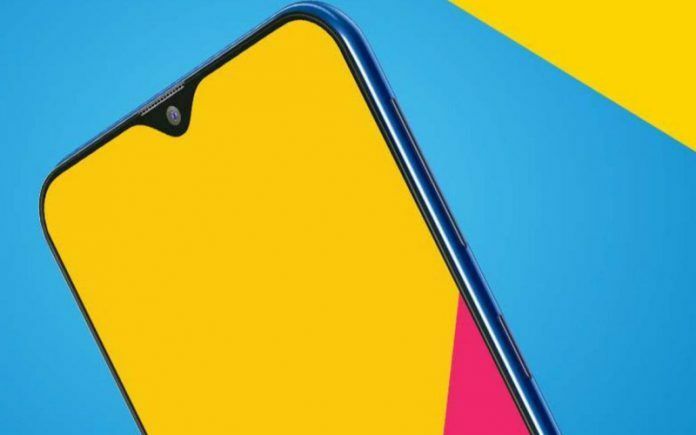 The phone features the same water drop notch at the top and has a tall display. 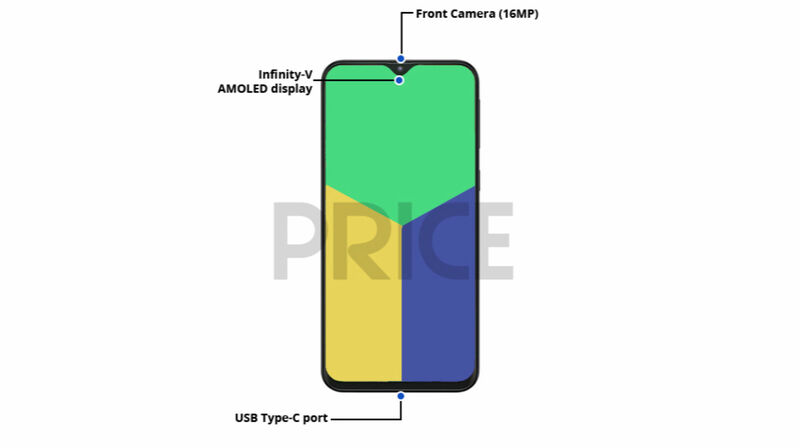 The schematic image clearly shows the location of various hardware aspects of the handset – including the positioning of the front and rear camera setup, the position of the loudspeaker, USB Type-C port, and the 3.5mm jack. The position of the fingerprint sensor at the rear is also clearly marked. 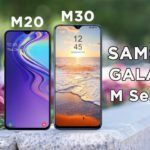 Visually identical to the Galaxy M20, the Galaxy M30 is likely to feature a large 6.38-inch AMOLED display (unlike the TFT panel used on the M20). The resolution, however, is expected to remain the same at 2220 x 1080 pixels. As for the SoC, the M30 seems to be getting the same Exynos 7904 that the M20 is powered by. 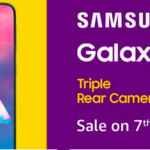 The phone will be sold in a single 4GB RAM + 64GB version with a triple slot for accommodating two SIM cards and a MicroSD card at the same time. 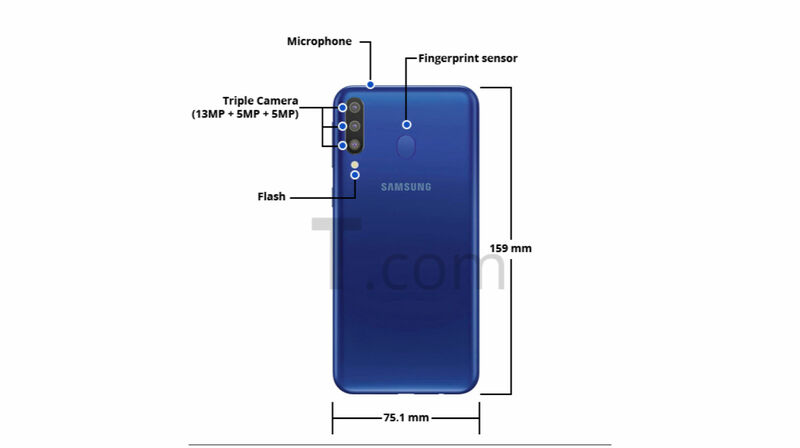 Moving on to the imaging department, like the Galaxy M20, the Galaxy M30 is also likely to get a triple camera setup consisting of a 13-megapixel primary camera and a 5-megapixel secondary camera mated to a third 5-megapixel sensor that is used for depth sensing information. The front facing camera is a 16-megapixel unit with an aperture of f/2.0. Like the M20, the Galaxy M20 also supports face unlock and adds in a fingerprint sensor for additional security. 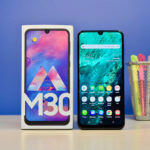 The M30 gets comprehensive connectivity options including support for 4G VoLTE networks, Wi-Fi 802.11 ac 2.4G + 5G, Bluetooth 5.0, and USB Type-C. The battery capacity remains identical to that of the M20 – 5,000 mAh. The M30 is likely to be officially launched before the end of the first quarter of 2019.